I remember playing with Teenage Mutant Ninja Turtles years ago with my younger brother and it’s fun to see them making a comeback. With the release of the new TMNT movie, these Ninja Turtles are popping up in parties everywhere. 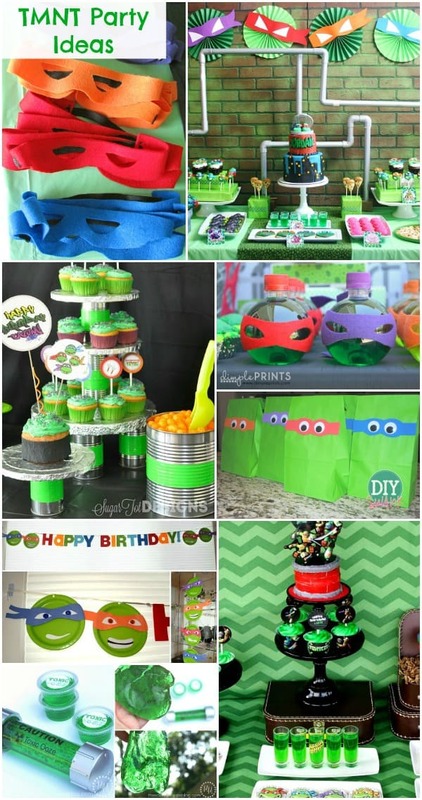 I’ve put together a creative collection of Ninja Turtle party ideas from other party planning mommas and bloggers. To view the full details of each party, simply click on the titles of each and they’ll open up in new windows for you. 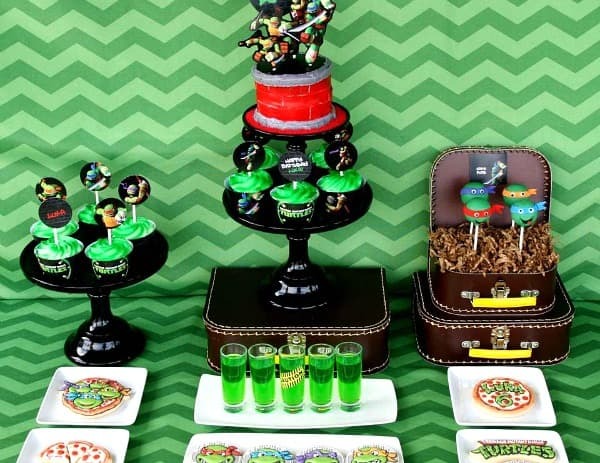 Don’t forget to visit our full TMNT Party category for more party ideas, TMNT-themed food ideas and more! 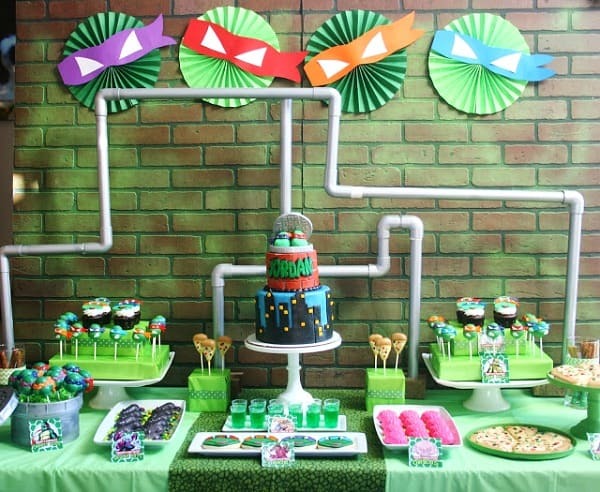 The city sewer background and pvc pipe “sewer pipe system” by And Everything Sweet in this TMNT Party (pictured above) is so brilliant! She really captured all the elements that make the Teenage Mutant Ninja Turtles so much fun. 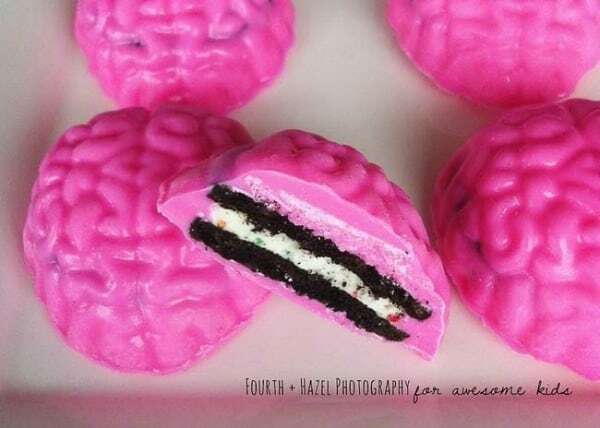 I love all the creativity in the cookies. 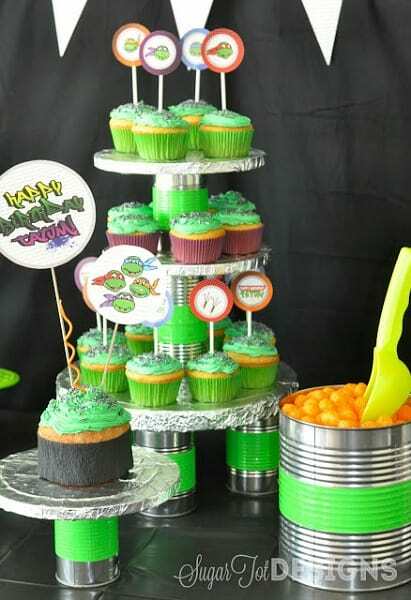 This TMNT themed cupcake stand by Sugar Tot Designs is super clever! You can easily recreate something similar for your own party and you have to check out the way she personalized the “sewer caps”. 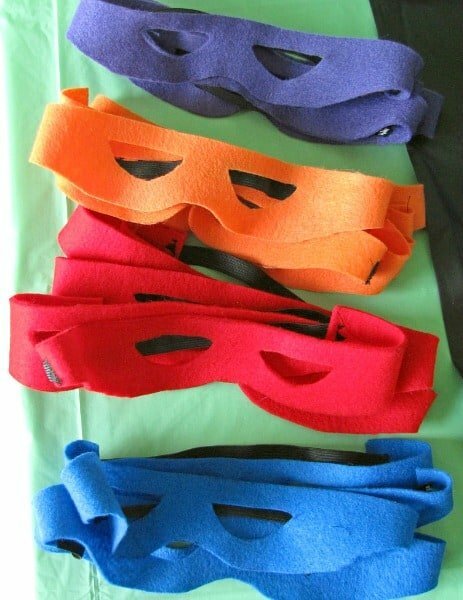 The party guests are sure to love these Ninja Turtle masks by Craving Some Creativity. The kids would love wearing these at the party and they double as a fun party favor. 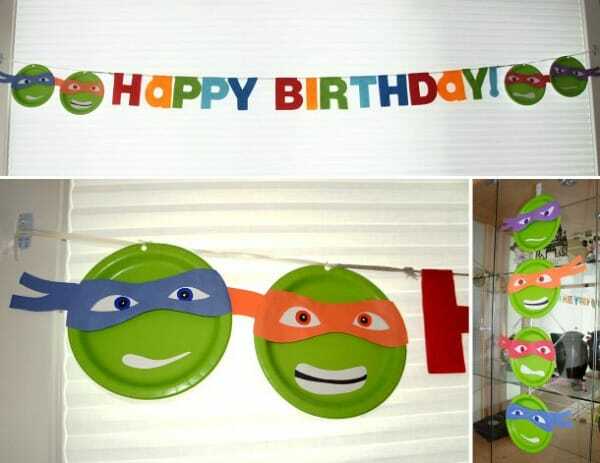 This idea by Dolled Up Design is simply brilliant – using green paper plates and construction paper as part of a TMNT party banner. There are so many creative touches in this Teenage Mutant Ninja Turtle Birthday featured on Catch My Party. The sewer cookies and Ninja Turtle cake pops are both so cute! Kids are sure to love these Ninja Turtle Shells! I can picture all the party guests with their shells & masks playing out in the yard. This would be one memorable party! 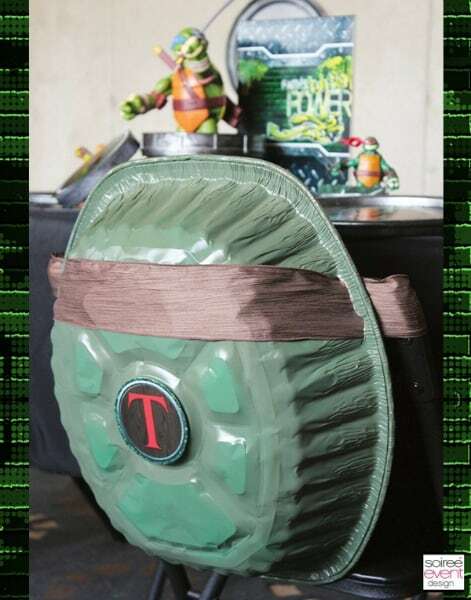 Find all the details for these Ninja Turtle Shells on Soiree Event Design. 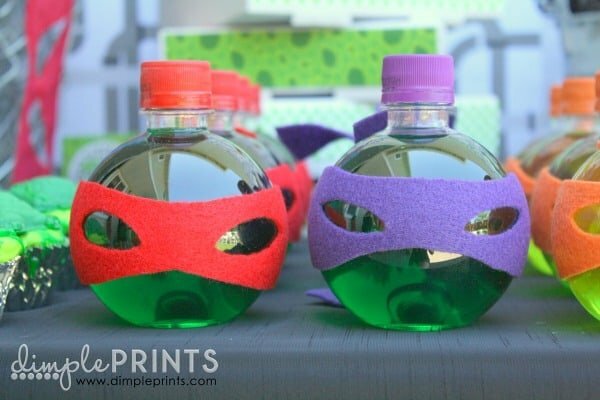 There are so many fun ideas in this TMNT Party on Dimple Prints. The place settings are so unique & clever and I love the way this green juice was dressed up as a Ninja Turtle. 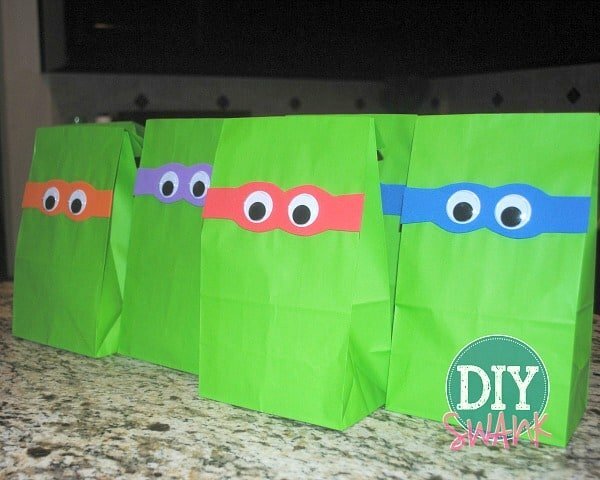 These DIY TMNT Favor Bags by DIY Swank are so easy to create and they fit the theme so perfectly. 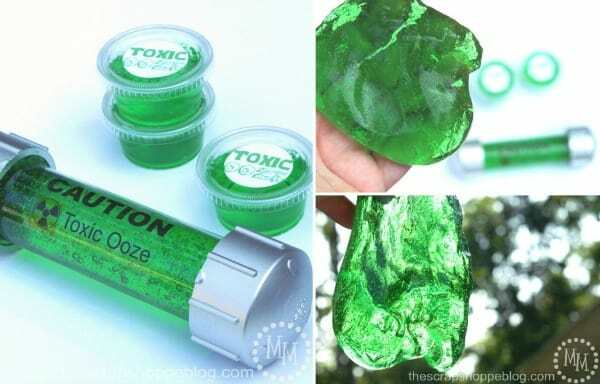 The kids would be so excited to find this “toxic ooze” in their TMNT favor bag. Find out how to make it over on The Scrap Shoppe. These Krang Cookies are creepy but fun – a theme you’ll see in so many boy parties! See all the party details by Fourth + Hazel on Spaceships and Laser Beams. Be sure to visit our Ninja Turtle category for more fun ideas like pizza recipes, dessert pizzas and more! It’s so fun seeing how things that were super popular when I was a kid are coming back in style. The toxic ooze was my favorite detail. Yes, that toxic ooze is so cool! Love the round bottle with the green juice. What type(brand) of juice is that.